« Can we really be too patriotic? NO! You can’t be a devout Christian and lift up prayers to Allah. It doesn’t work that way! Paul E. Vallely is a retired US Army Major General and senior military analyst for Fox News. 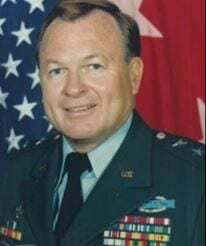 He served in the Vietnam War and retired in 1993 as Deputy Commanding General, Pacific Command. In 2004, together with retired Air Force Lieutenant General Thomas McInerney, Vallely co-authored the book Endgame: The Blueprint for Victory in the War on Terror. Vallely currently serves as the Military Committee Chairman for the Center for Security Policy and has lent his support to the organization Veteran Defenders of America. We have North Korea surrounded and we’re watching them 24/7. Sanctions won’t work with North Korea. We have plenty of options available to us. We can take missiles down out of the air if we have to. Tokyo is also at risk. But China has no incentive to pressure NK because NK is no threat to them. China is working to rebuild the old silk route with India, Pakistan, and other countries. Russia is filling the vacuum in the Middle East and working on an oil pipeline. America is the true Super Power in the world again because of our new leadership. Was N. Korea involved in the Philippines ramming our destroyer? Sec. of State Tillerson has been cleaning house in the State Department. And other departments are doing the same. The Swamp is being drained daily, but the media isn’t reporting it. Gen. Mattis has put a halt to the social experiment the Obama Admin launched in our military. And Trump loosened the reigns allowing our military make the decisions they needed to make in the FIELD! As it should be.